I’ve been a fan of Japanese-influenced fixed blades for some time, the ancient cord-wrap over ray skin combined with modern steels and shapes. One of my favorite contemporary makers in this space is Mike Snody, whose website has lots of examples of these fusion designs, alas most of them out of my price range and patience scale. I am combining these two reviews NOT because they compete in the same application space (they don’t, as you will see) but because of their Japan-meets-the-future styling. 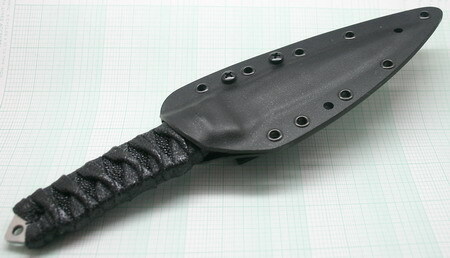 Lets begin with the JuJu, a beefy knife to be sure, sporting a wharncliffe shape and real chisel ground edge. What is amazing to me about this knife is the very low cost (I got mine for $54) combined with a decent feature package. The aggressive looks border on fantasy-knife, therefore I won’t be carrying it much. 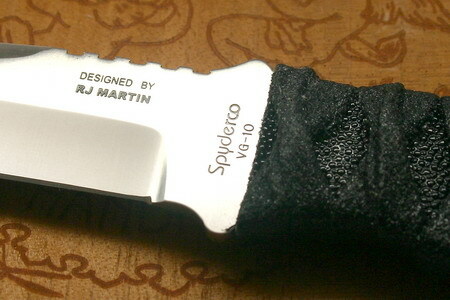 This brings us to the Spyderco Kumo, a smaller knife with a thinner blade and more expensive materials. Whereas the Juju feels beefy enough to be a camp knife, the Kumo is more refined and discreet. Spyder Menuki. Just awesome. I want to buy some loose ones! I can see myself trying to carry the Kumo from time to time, however it still looks aggressive compared to a folder. Sometimes it’s hard for me to get out of the dirk and dagger California mentality. I am happy to own both of these knives; I hope they do well for the factories as well as the designers. Coming next: some non-knife gear! Well that didn’t take long. Snow arrived in a big way, I decided to work from home for the day. I forgot how heavy snow is. I am working on a large review of the Kumo compared with the Juju, more on that this weekend. Stay tuned, fixed blade goodness soon.